Yitzhak Arad (Hebrew: יצחק ארד‎) (né Icchak Rudnicki) (born November 11, 1926), is an Israeli historian, author, retired IDF brigadier general and a former Soviet partisan, director of Yad Vashem from 1972 to 1993. He specialised in the history of the Holocaust. Arad was born Icchak Rudnicki on November 11, 1926, in what was then Święciany in the Second Polish Republic (now Švenčionys, Lithuania). In his youth, he belonged to the Zionist youth movement Ha-No'ar ha-Tsiyyoni. During the war – according to Arad's 1993 interview with Harry J. Cargas – he was active in the ghetto underground movement from 1942 to 1944. In February 1943, he joined the Soviet partisans of the Markov Brigade, a primarily non-Jewish unit in which he had to contend with antisemitism. Apart from a foray infiltrating the Vilna Ghetto in April 1943 to meet with underground leader Abba Kovner, he stayed with the Soviet partisans until the end of the war, fighting the Germans, taking part in mining trains and in ambushes around the Naroch Forest of Belarus. "The official attitude of the Soviet partisan movement was that there was no place for Jewish units" acting independently, said Arad. In December 1945, Yitzhak Arad immigrated without authorization to Mandate Palestine , on the Ha'apala boat named after Hannah Szenes. In Arad's military career in the IDF, he reached the rank of brigadier general and was appointed to the post of Chief Education Officer. He retired from the military in 1972. In his academic career as a lecturer on Jewish history at Tel Aviv University, he has researched World War II and the Holocaust, and has published extensively as author and editor, primarily in Hebrew. His current research deals with the Holocaust in the USSR. 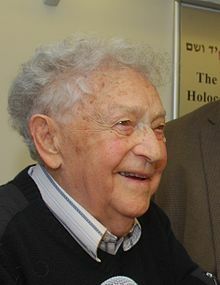 Dr. Yitzhak Arad served as the director (Chairman of the Directorate) of Yad Vashem, Israel's Holocaust Remembrance Authority, for 21 years (1972–1993). He remains associated with Yad Vashem in an advisor's capacity. Arad was awarded Doctor honoris causa degree by Poland's Nicolaus Copernicus University in Toruń on 7 June 1993. In 2006, following a story in the Lithuanian Respublika newspaper that called Arad a "war criminal" for his alleged role in the Koniuchy massacre perpetrated by anti-Nazi Soviet partisans, the Lithuanian state prosecutor initiated an investigation of Arad. Following an international outcry, the investigation was dropped in the fall of 2008. Arad said he had nothing to apologize for, and that he was "proud" that he "fought the Nazi Germans and their Lithuanian collaborators ... the murderers of my family, the murderers of my people." Arad has said he believes the investigation was motivated by revenge for expert evidence he gave in a United States trial of a Lithuanian Nazi collaborator. British historian Martin Gilbert said he was "deeply shocked" by the "perverse" investigation. Efraim Zuroff pointed out that the Lithuanian government had never prosecuted a single war criminal, despite the evidence that Simon Wiesenthal Center had collected and shared. According to Zuroff, "What is common to all these cases is that they're all Jews. Instead of punishing Lithuanian criminals who collaborated with the Nazis and murdered Jews, they're harassing the partisans, Jewish heroes." Some 200,000 Jews were murdered in Lithuania during the Holocaust, mainly by Lithuanian collaborators. Lithuania's record of prosecuting war criminals has been spotty, leading The Economist to write that the investigation against Jews was selective and even vindictive. According to Dovid Katz, this is "Holocaust obfuscation" that "involves a series of false moral equivalences: Jews were disloyal citizens of pre-war Lithuania, helped the Soviet occupiers in 1940, and were therefore partly to blame for their fate. And the genocide that really matters was the one that Lithuanian people suffered at Soviet hands after 1944". He was born Icchak Rudnicki, later adopting the Hebrew surname Arad (Hebrew: ארד‎). During World War II, he was known as Tolya (Russian diminutive for Anatoly) in the underground and among the partisans. ^ Interview with Yitzhak Arad From Voices from the Holocaust By Harry J. Cargas, published by University Press of Kentucky, 1993. ^ UMK Senat (2016). "Doktorzy honoris causa UMK". Nicolaus Copernicus University, UMK.pl. Brook, Daniel (July 26, 2014). "Double Genocide: Lithuania wants to erase its ugly history of Nazi collaboration—by accusing Jewish partisans who fought the Germans of war crimes". Slate. This page was last edited on 23 March 2019, at 00:01 (UTC).